Bella Blvd + Craftwell + Tombow = Inspiration Galore! We kick off this long week "blog inspiration hop" with Mitsyana Wright's gorgeous layout! Now check out Mitsy's pretty layout! Hi Crafty Friends... Last weekend my two beautiful daughters had their very first dance recital. And like any proud mama I was there taking picture like crazy trying to get every moment possible. We worked our tails off all year for this event (and yes, I worked my tail off too, even though I wasn't the one actually doing the dancing) and I wasn't going to let any photo-op slip away from me. So, what better way to document this special event than with a scrapbook layout. And, even better, our awesome friends at Bella Blvd. is sponsoring Team Cut'n'Boss for the month of June!! Their papers and embellishments were just a perfect match for my little divas!! Bella Blvd. Color Chaos Invisibles- Click! Click! I started by first airbrushing my Spectrum Noir markers is TB7 and PP4 to the back side of my Bella Blvd Invisible. I love all the adorable cameras on this huge scallop circle!! Too, too cute!! These sheets are transparent and made of a thick but flexible plastic. I wanted to add some pop to my cameras so adding color was a no brainer. The back side of the sheets are matted with texture so adding color is a cinch. But ebrushing with my Spectrum Noir markers still leaves it transparent and I really didn't want the patterned paper I was layering it on to distract from those cute cameras... so I quickly added a layer of gesso directly over the colors and set aside to dry. While that was drying, I used my Cut'n'Boss to cut out all my Teresa Collins Pocket Dies out of metallic gold cardstock. And because it has a huge cutting platform I can cut them all my dies at once. Can you believe I was able to cut all of these dies all at once?!! All 13 dies cut through with one passing... HOLY COW... that saved my arms from a lot of cranking! I ran all my pieces in my Xyron Sticker makers and Create-a-sticker machines. I try to run them through my Xyrons as soon as they are cut so I don't lose all the little pieces and ,besides, I love the fact that they're ready to just pop right onto my projects. 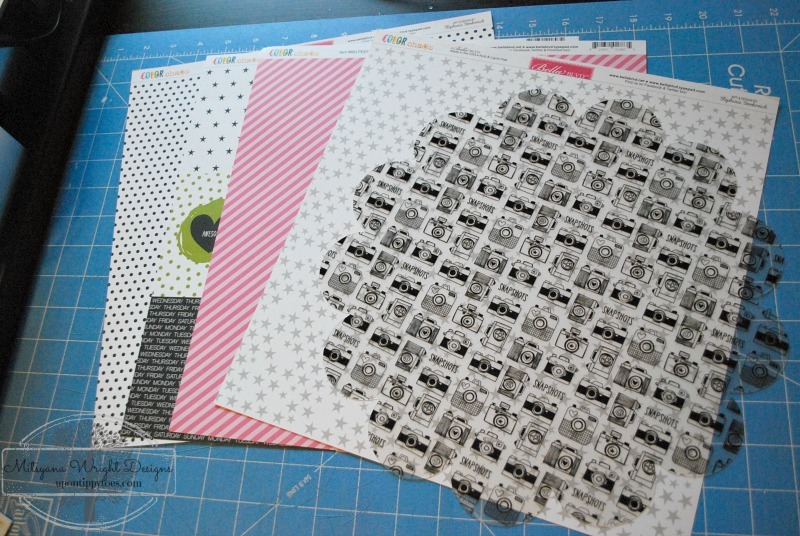 I use the Stars side of the Peep Strandz patterned paper as my base. Then adhere my invisibles Click! Click! sheet over the center. I then cut a 5"x 9" piece of Bella Blvd. 's Peeps Strandz paper (pink striped side) as a photo mat. I cut out the cute little matching camera Bella Blvd. 's Daily Details paper and used it as an embellishment and finally topped it all off with my golden cut outs Bella Blvd yummy enamel dots. Hope you enjoyed my project for today!! Thanks for stopping by!! And I hope you have a very crafty day!! For more inspirational projects visit my personal blog at upontippytoes.com!! guess I'll miss the giveaway. Don't do instagram. Bummer! Good news, is that there is always fun giveaways going on here! Stay tuned!